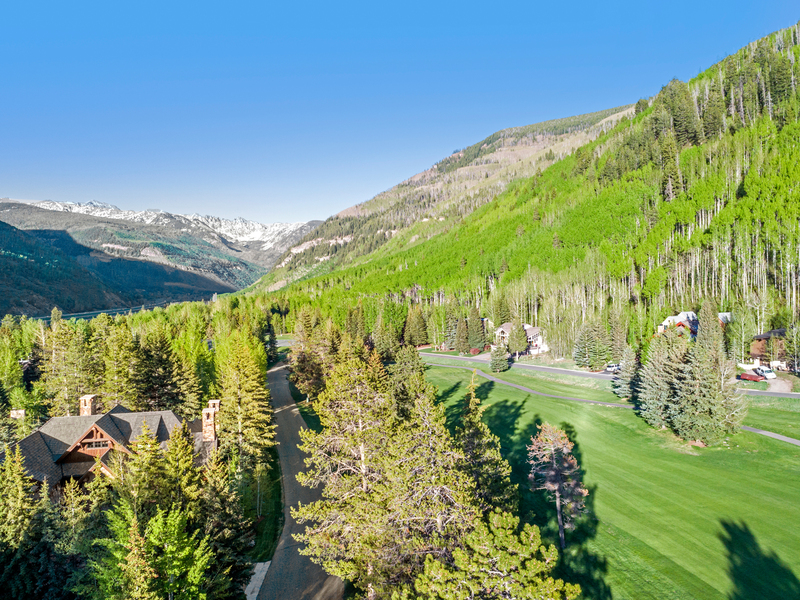 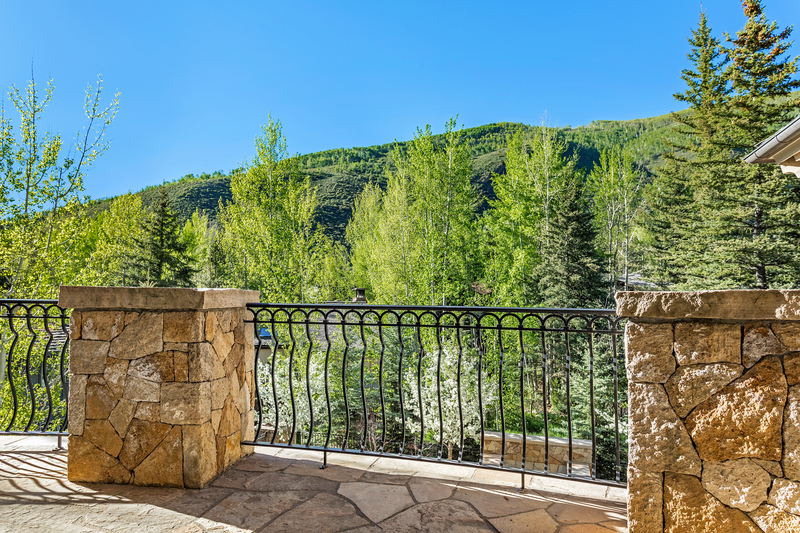 This Mediterranean style home sits on the iconic Vail Golf Course within walking distance of Ford Amphitheater, Betty Ford Alpine Gardens and Golden Peak. 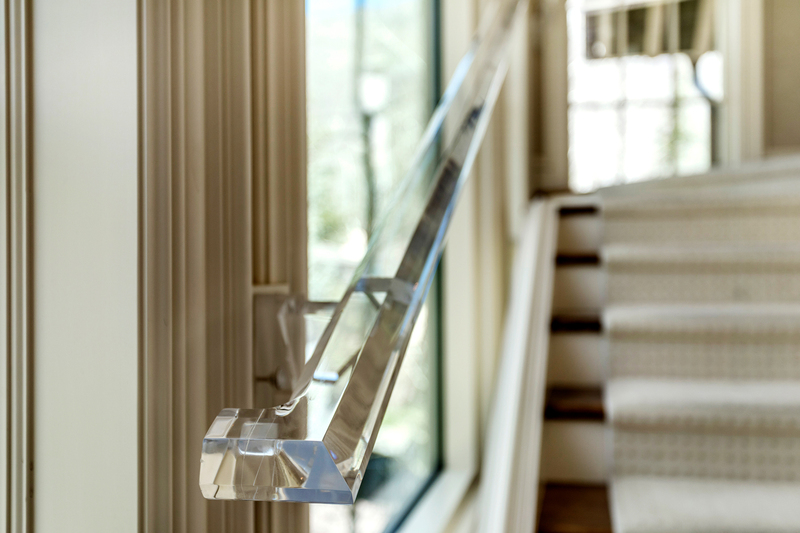 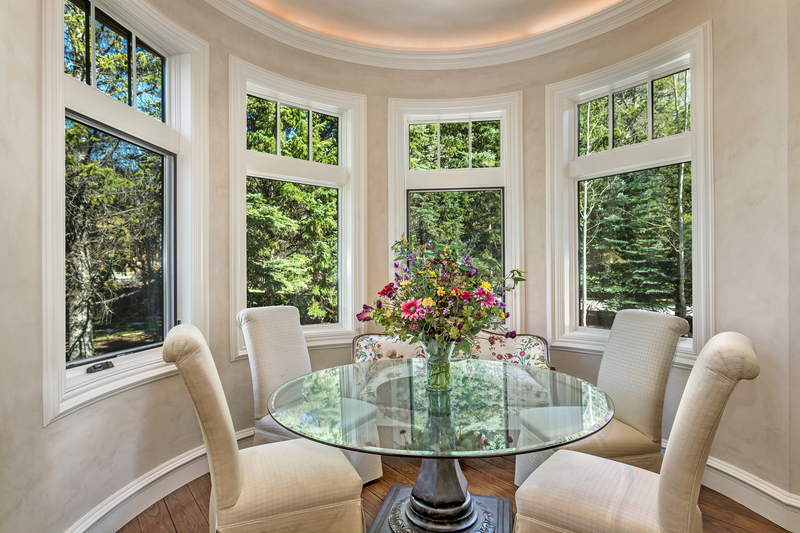 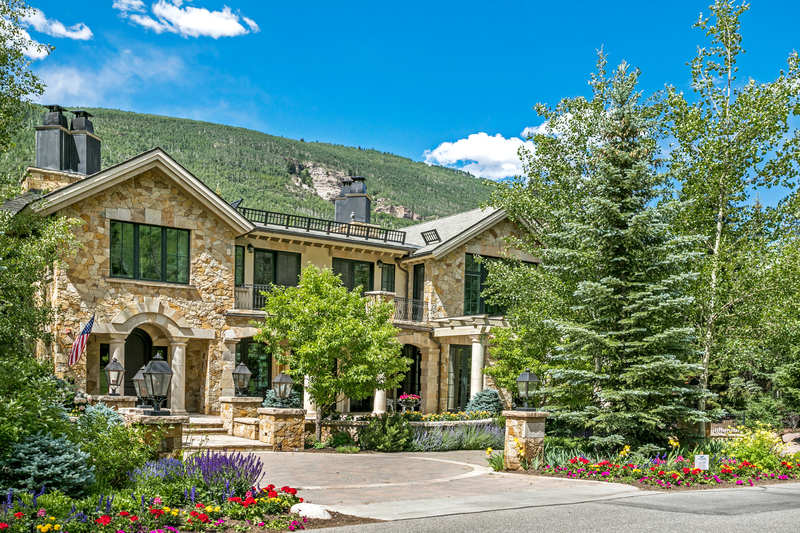 The 8,416-sf custom home completed in 2009 exudes a stately elegance and inviting atmosphere. 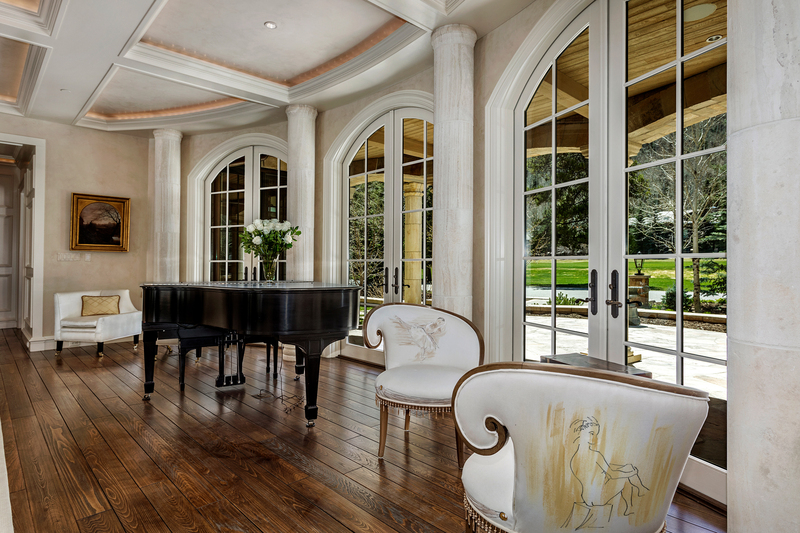 The grand, arched entry welcomes you into the foyer which then unfolds to reveal a living room supported by rows of Riviera limestone columns that is capable of hosting lavish affairs as it is encouraging hours of comfortable relaxation. 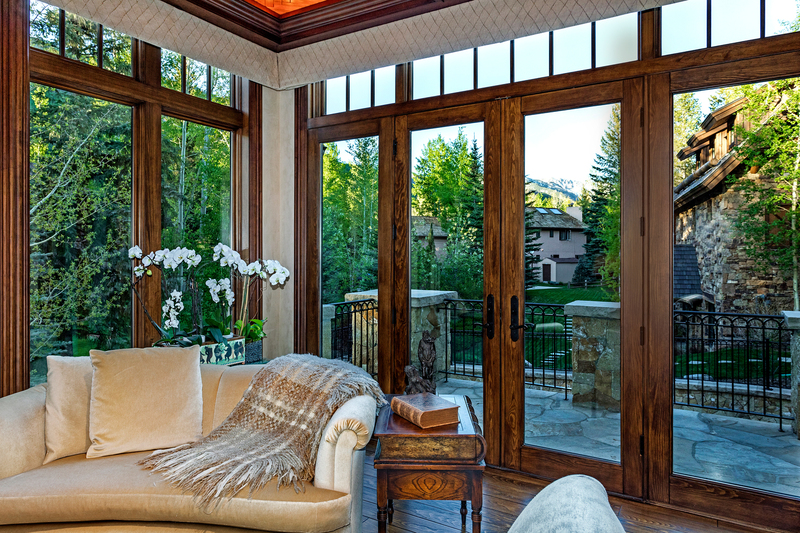 An abundance of out-swing, custom French doors welcomes natural light into the living room bridging inside with the splendor of the outdoors. 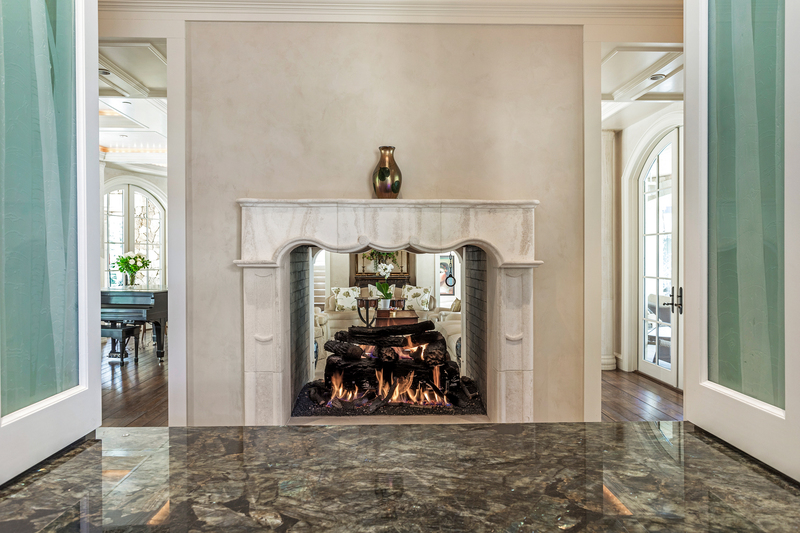 Many holidays, charity events and parties have been hosted around the curated limestone fireplaces creating boundless family memories. 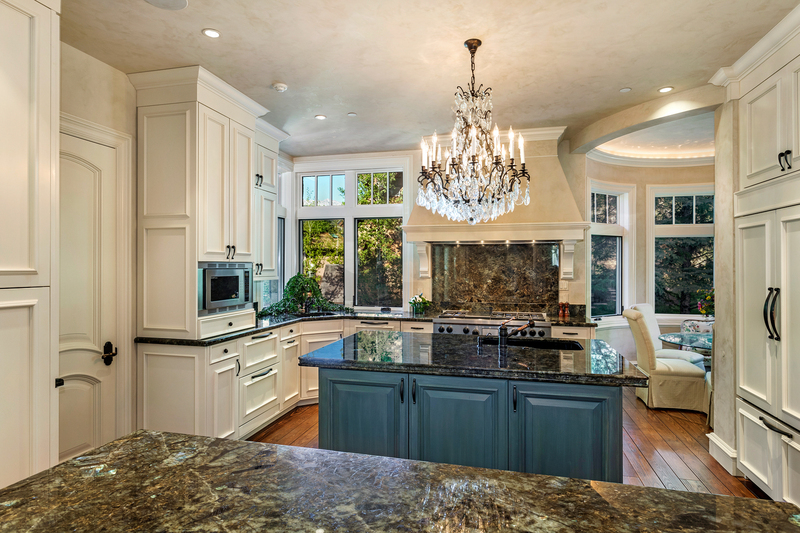 A tremendous, Labradorite appointed kitchen with an offset breakfast nook suits the most discriminating culinary aficionados and active families, yet has the ability to quickly turn into an entertainer’s dream. 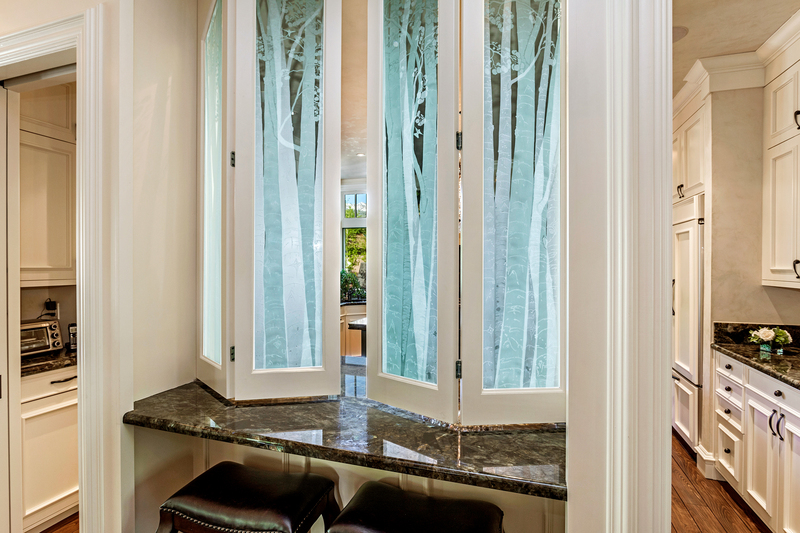 Hand-crafted, glass-etched panels of Aspen trees and additional pocket doors allow the kitchen to be closed off from the rest of your guests. 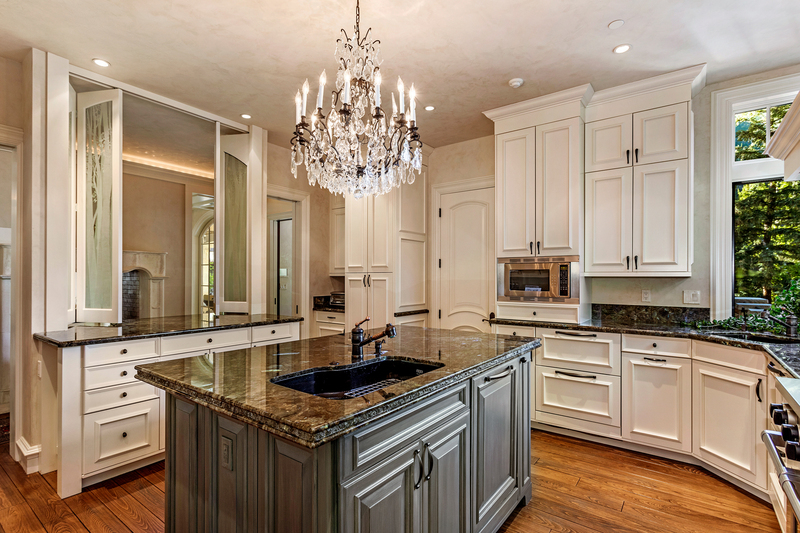 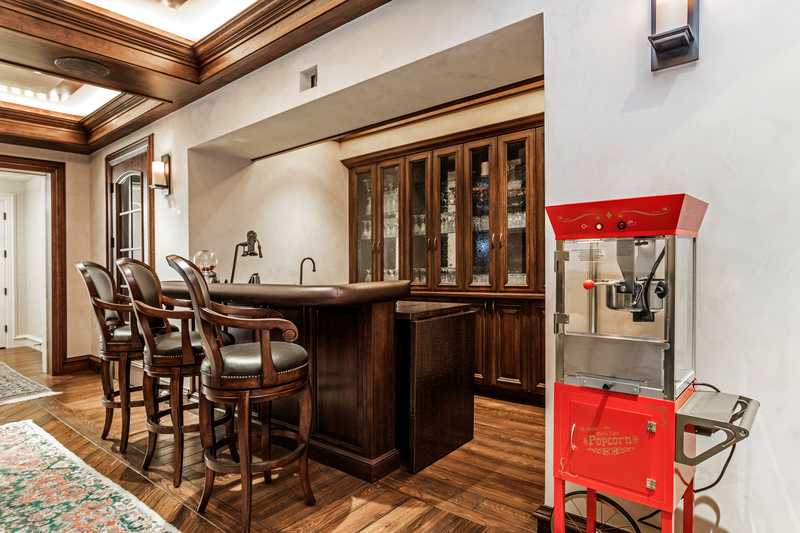 Custom woodwork extends throughout the gourmet kitchen from the front panels of the three ovens, the refrigerator, dishwashers and pantry creating a seamless design to blend with the cabinetry. 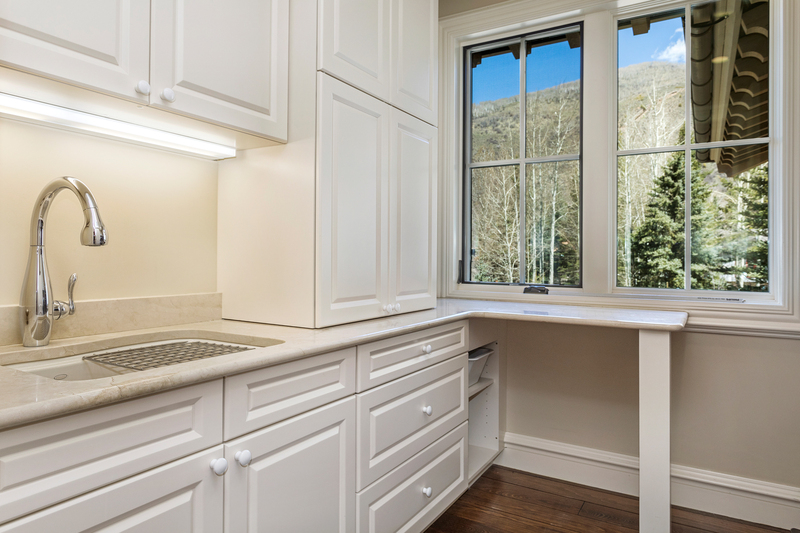 One of the labradorite countertops that backs up to the double-sided, living room fireplace is heated to ensure that both you and your coffee remain warm while enjoying the cool mountain mornings. 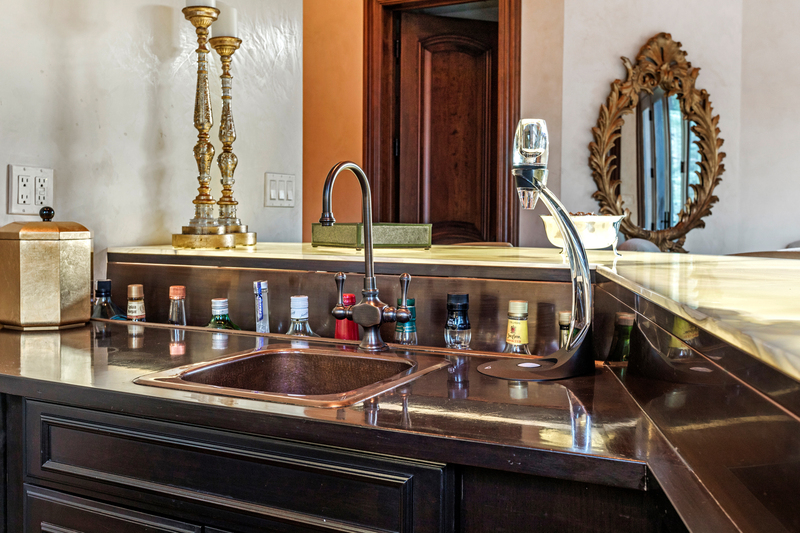 A Wolf stove top, Fisher & Paykel and Bosch appliances beckon novice to advanced cooks while Vilroy and Boch ceramic sinks make a design statement of unparalleled quality. 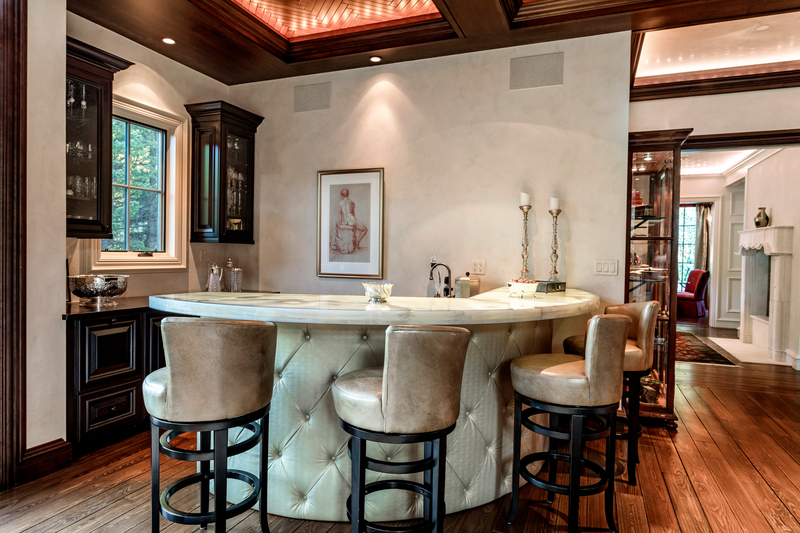 Venetian plaster walls envelop the home with silky texture bringing a piece of the earth inside. 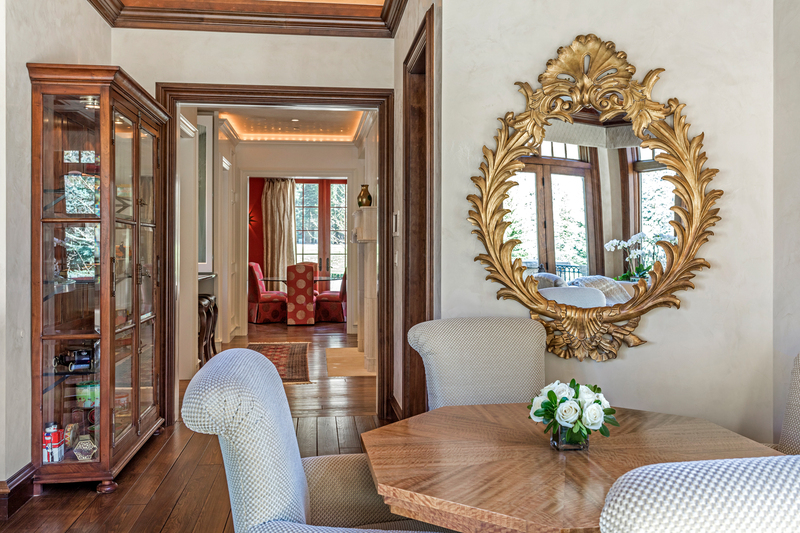 Another set of custom French doors open to the front patio from the formal dining room creating a wonderful indoor/outdoor dining experience. 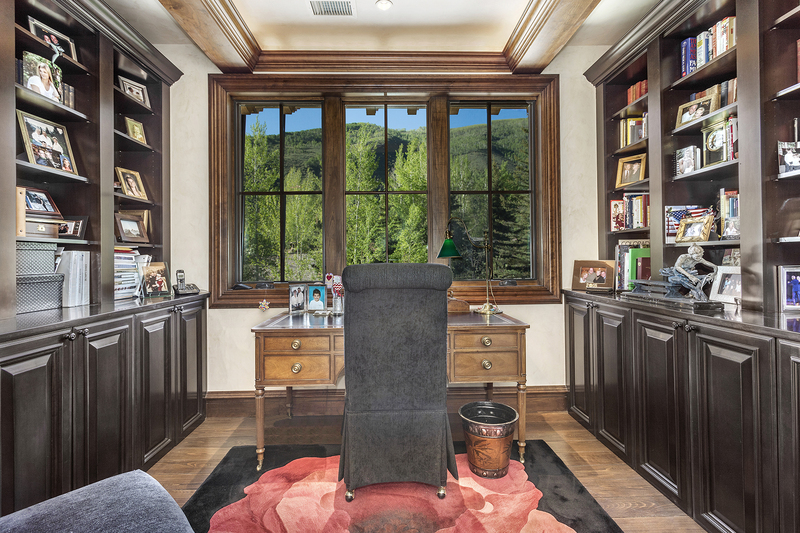 The Family Room on the East side of the home provides a magnificent view of the Gore Range, especially at late afternoon sunset. 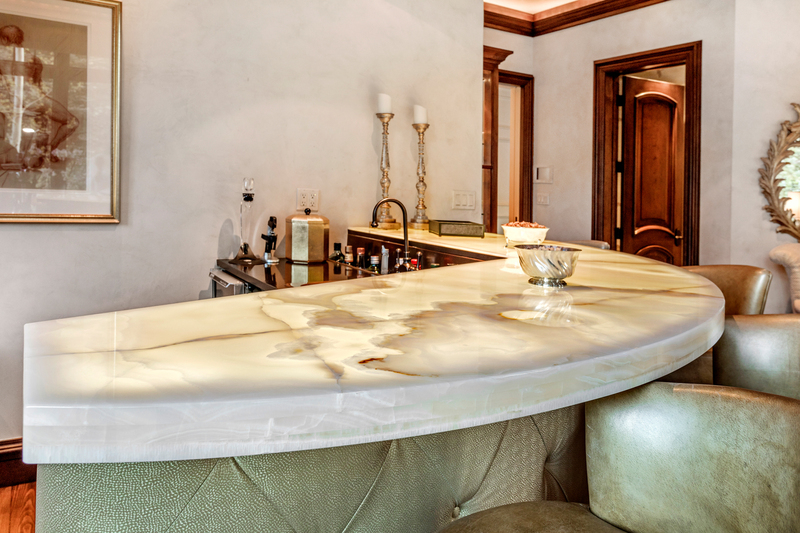 A stunning centerpiece is the backlit, white onyx countertop on the cocktail bar. 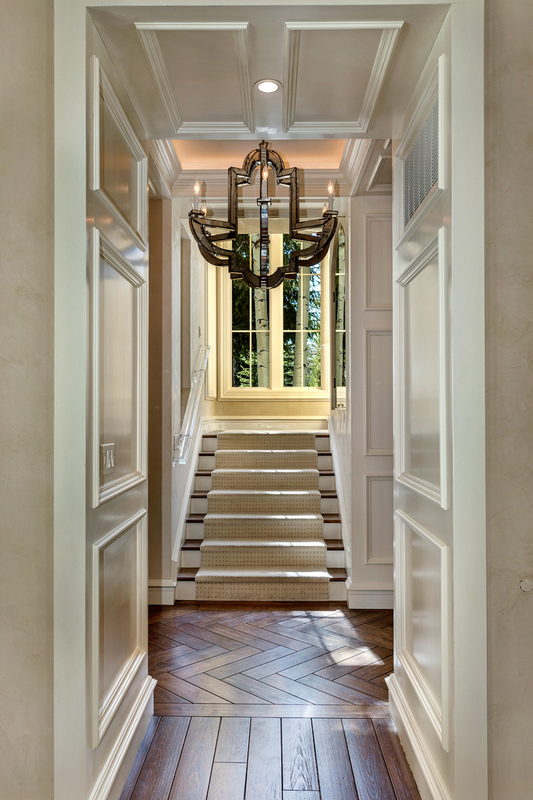 Yet this room is easily dominated by the coiffured ceiling, lit from above with a herringbone, hand-crafted wood inlay. 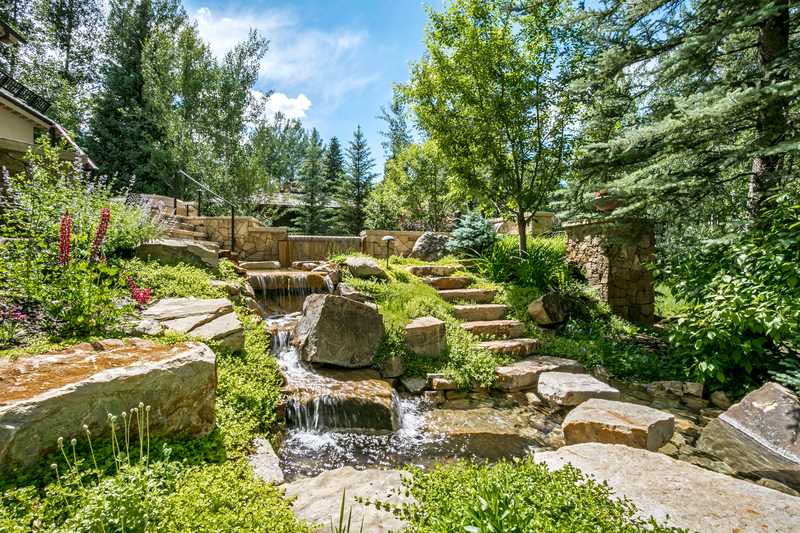 This property that was built on romance and friendship bestows abundant and lush grounds, with immaculate, award-winning landscape architecture. 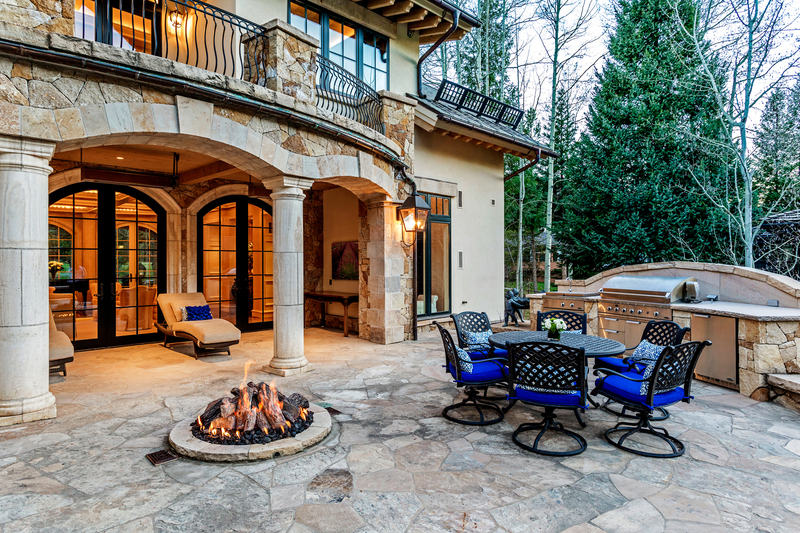 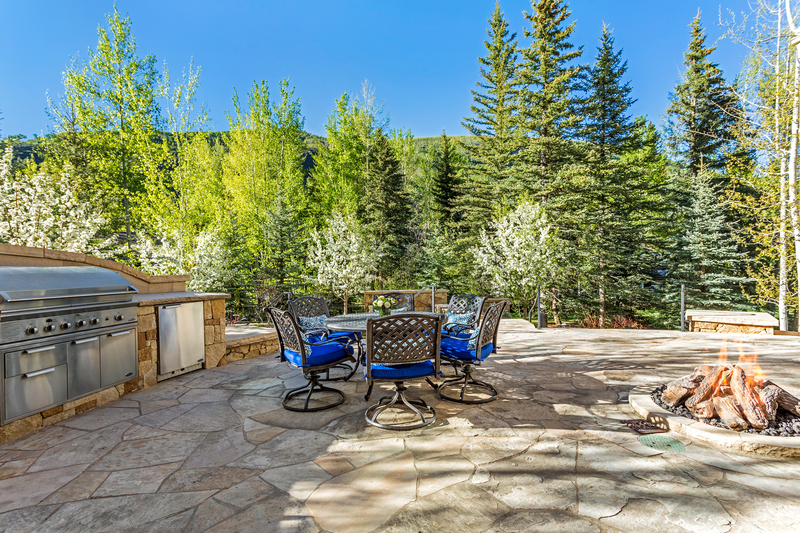 An outdoor living room and kitchen with overhead heaters, heated flagstone and a fire-pit allow owners and guests to enjoy the outdoor spaces throughout the winter months. 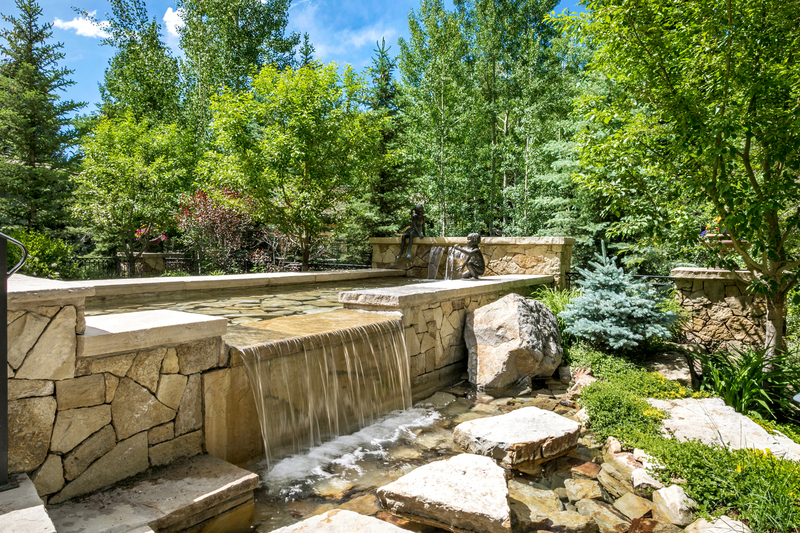 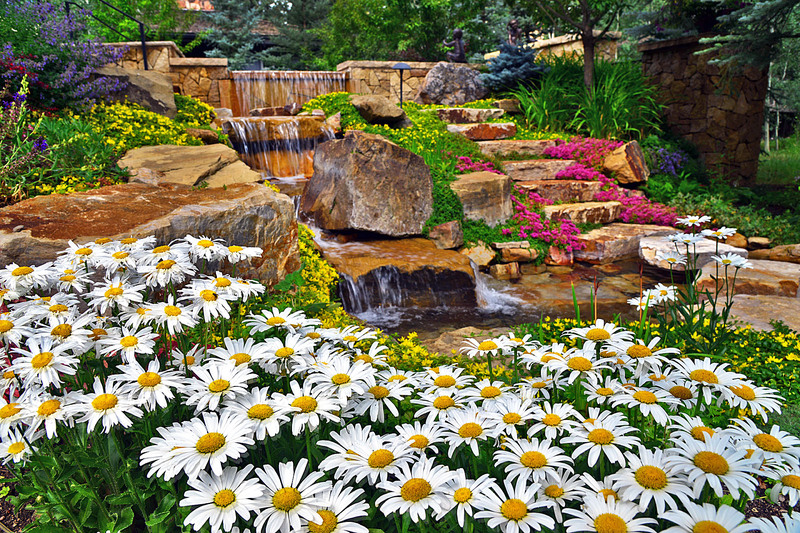 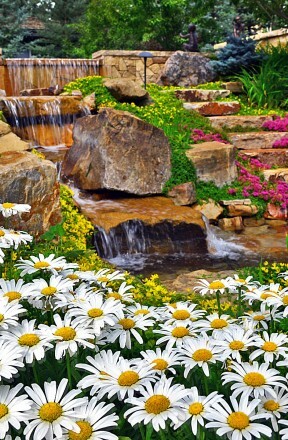 The reflecting pool exudes a peaceful charm while mirroring the natural surroundings and multiple waterfalls cascade by specially selected boulders allowing you to walk through your water garden. 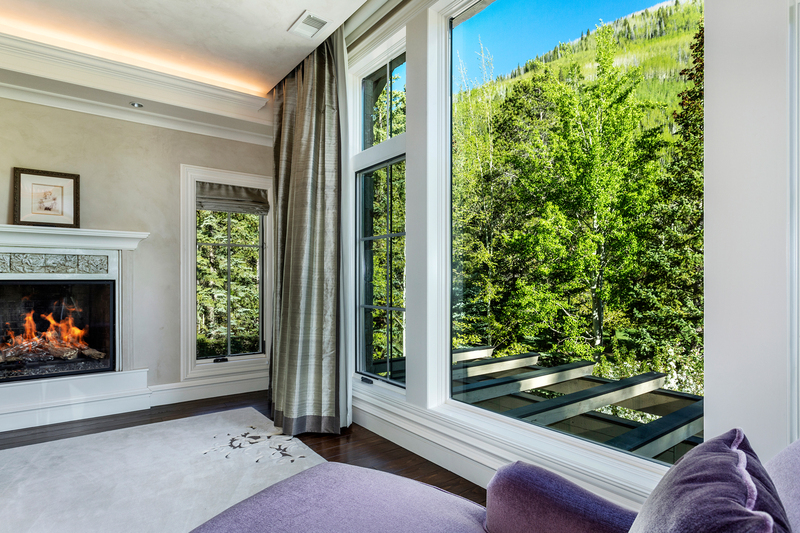 The master suite encompasses the upper east wing with a dominating view of Vail Mountain from the bedroom. 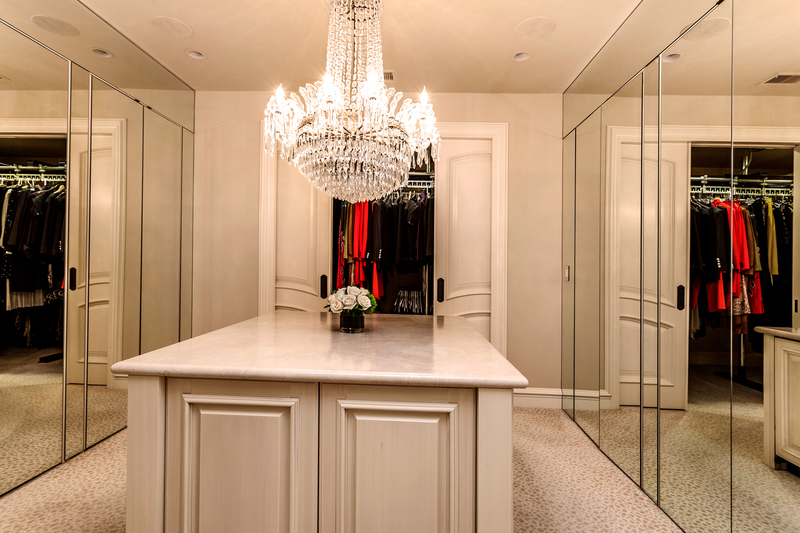 An impressive dressing room is adorned with floor-to-ceiling mirrored doors, a refrigerator, ice maker and a closet carousel perfect for rotating your seasonal clothes. 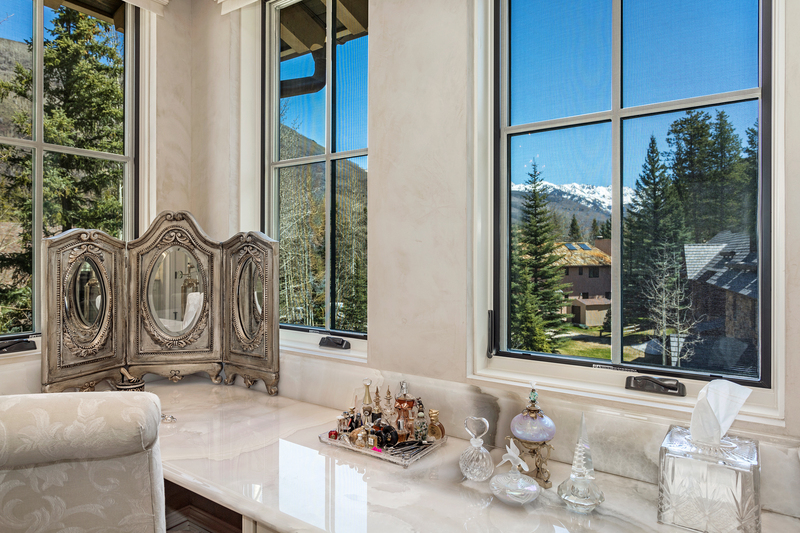 The glamorous, jaw-dropping master bathroom gives way to another spectacular view of the Gore Range. 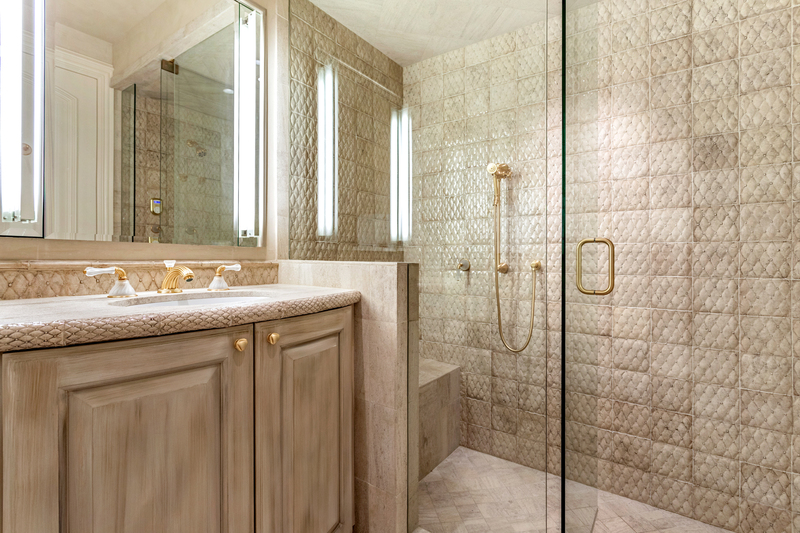 An industrial, glass, shower for two with European gold fixtures is central to the flawless design in this stunning spa-like bathroom. 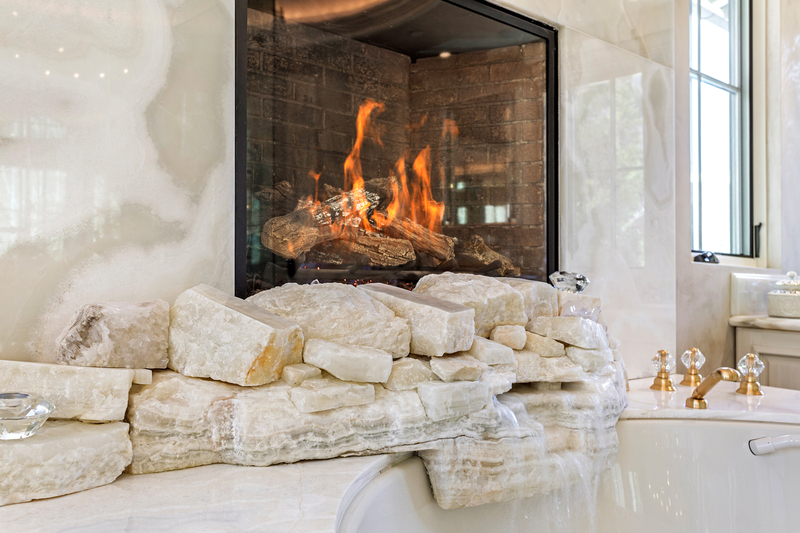 A white onyx bubble tub with a heated bottom is situated next to a functioning fireplace. 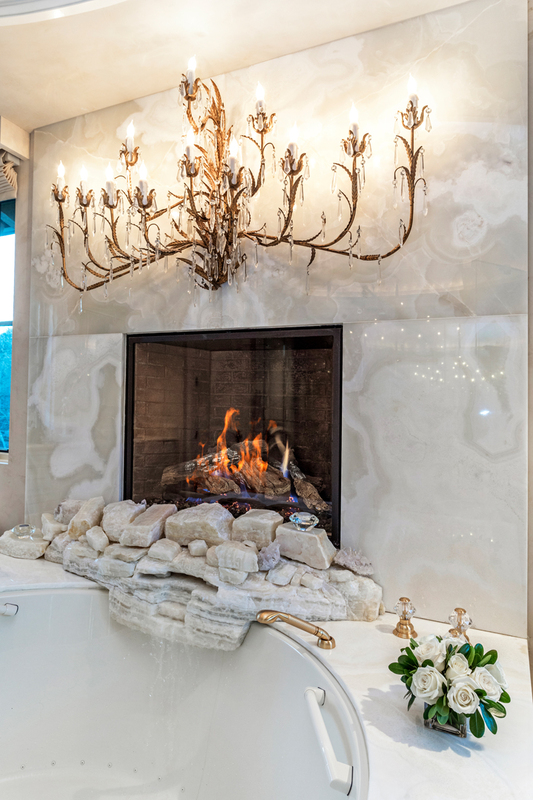 The mountain of organically positioned white onyx hiding the faucet creates a waterfall into the tub that transcends ultimate luxury. 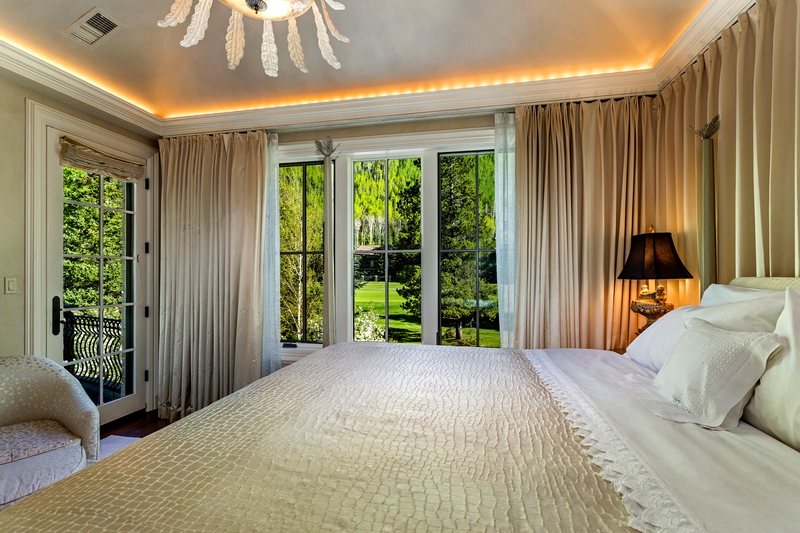 Every room including the three guest bedroom suites on the top floor open to the outdoor, heated patios. 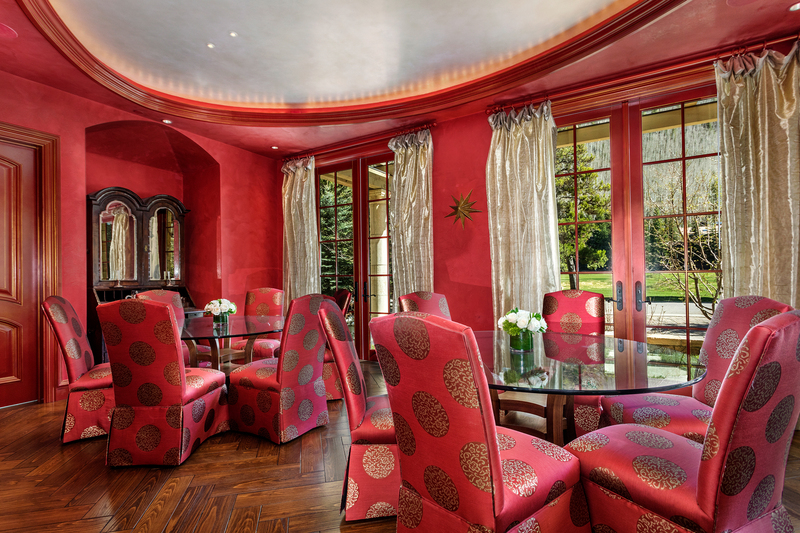 Each room was thoughtfully planned to be unique from the others. 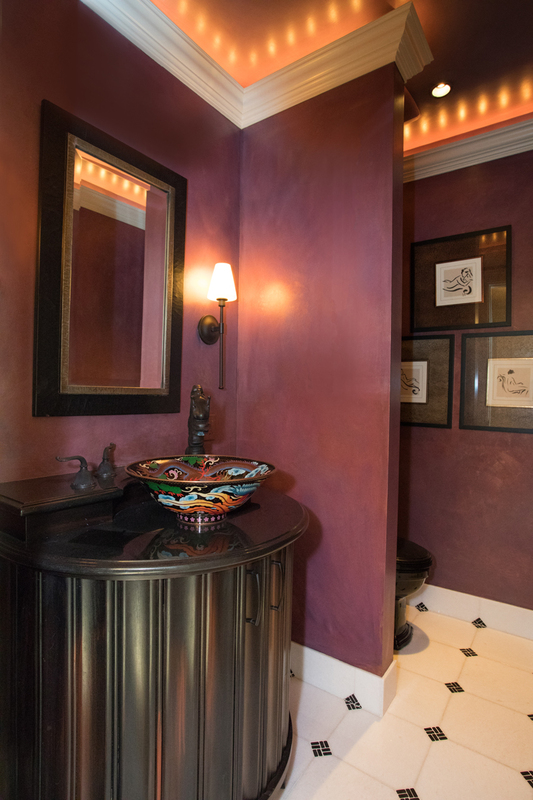 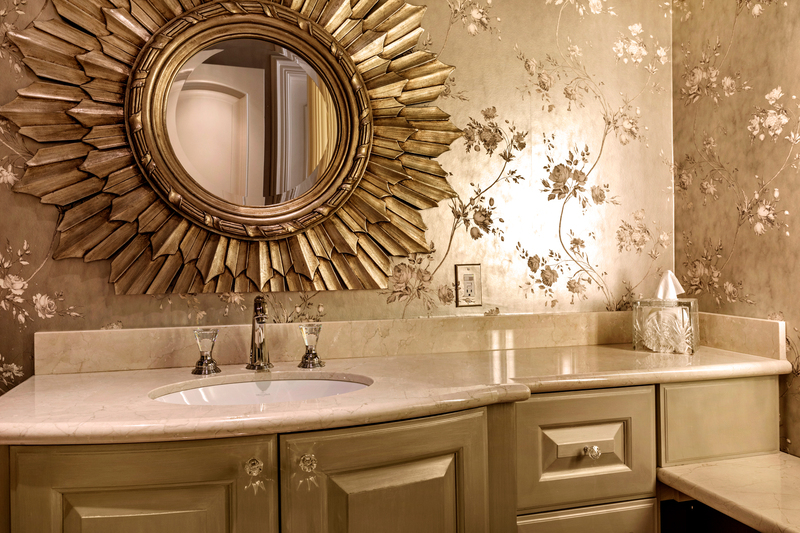 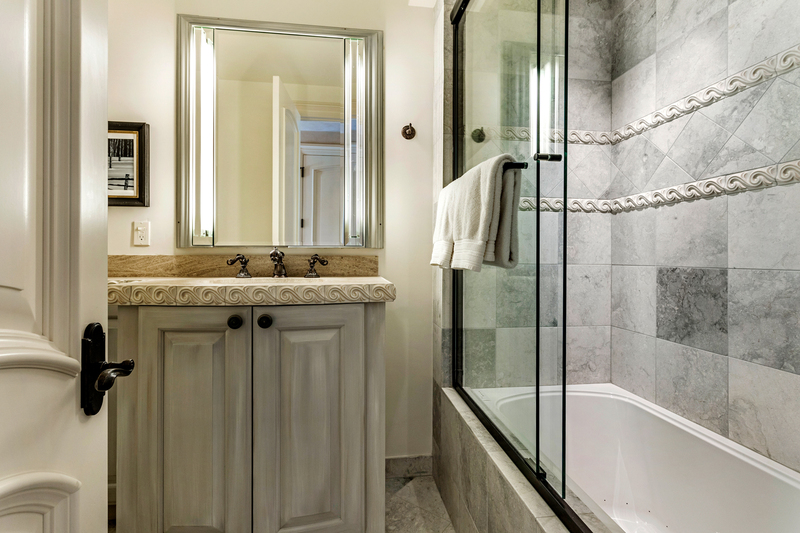 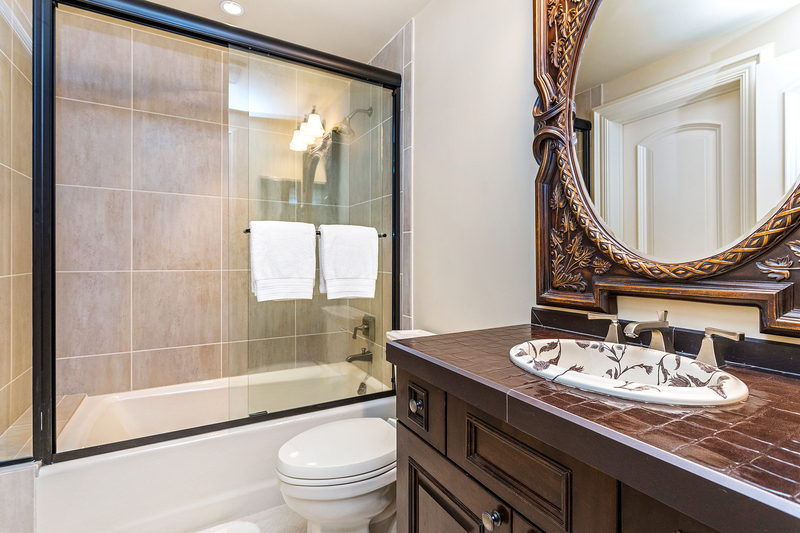 Hand painted ceramic tiles and an etched bathroom floor are timeless, yet boldly distinctive details. 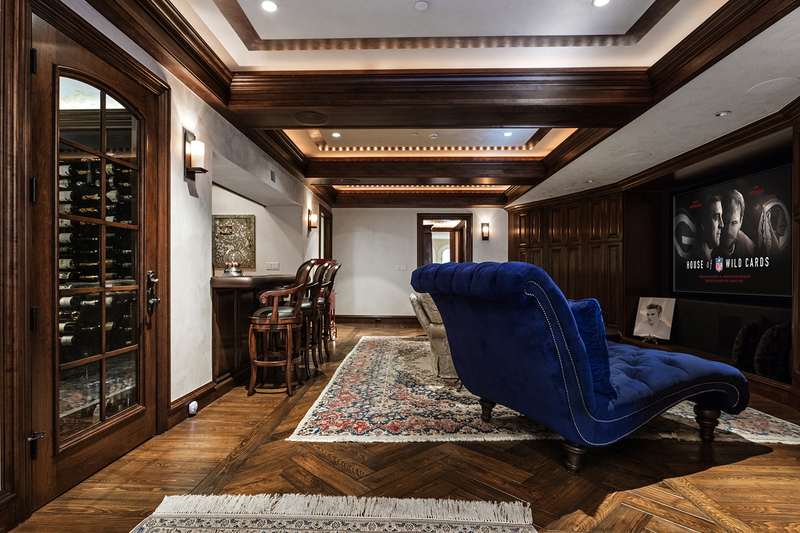 The lower level is theater room-ready and is presently a paradise for all ages with a wet bar, and wine cellar. 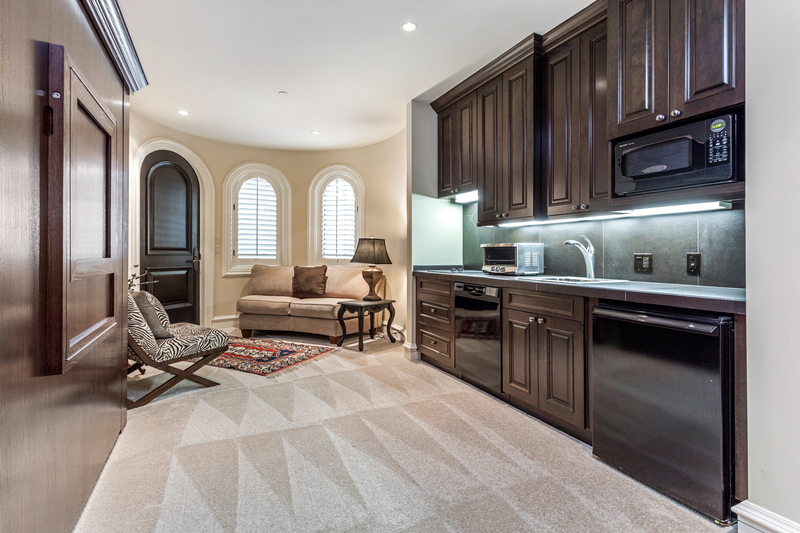 An additional bedroom suite and laundry room is just beyond with an exterior access door to allow your guests to come and go freely. 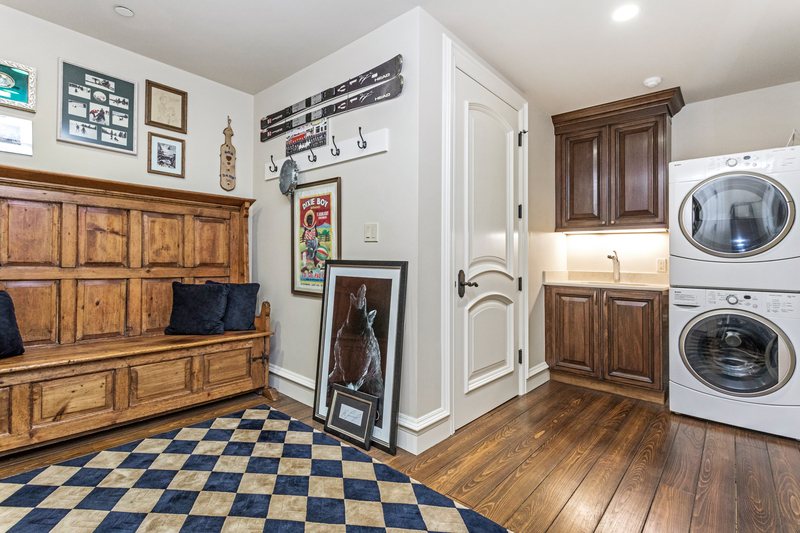 With both a craft room and a home office, the ability to get all your daily necessities completed is all within reach. 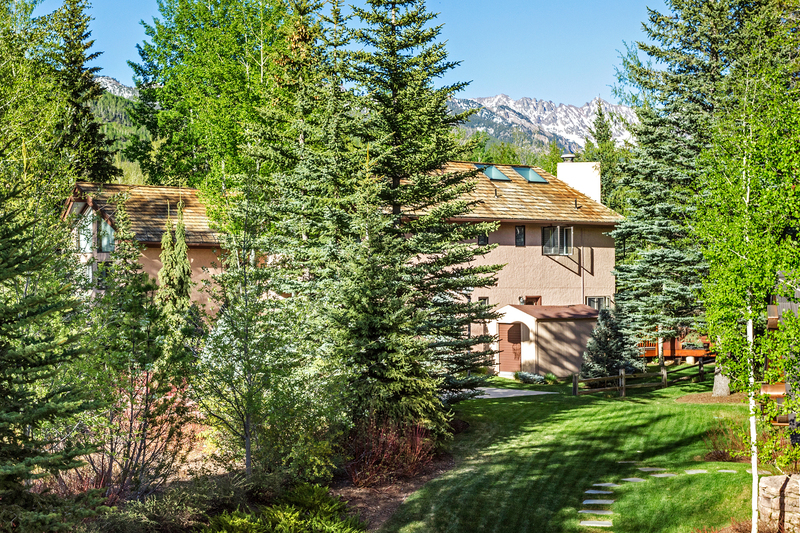 There is garage parking for 3 vehicles, abundant storage and flexible space where all of your mountain toys can be stored with additional parking available on the heated, pavered auto-court. 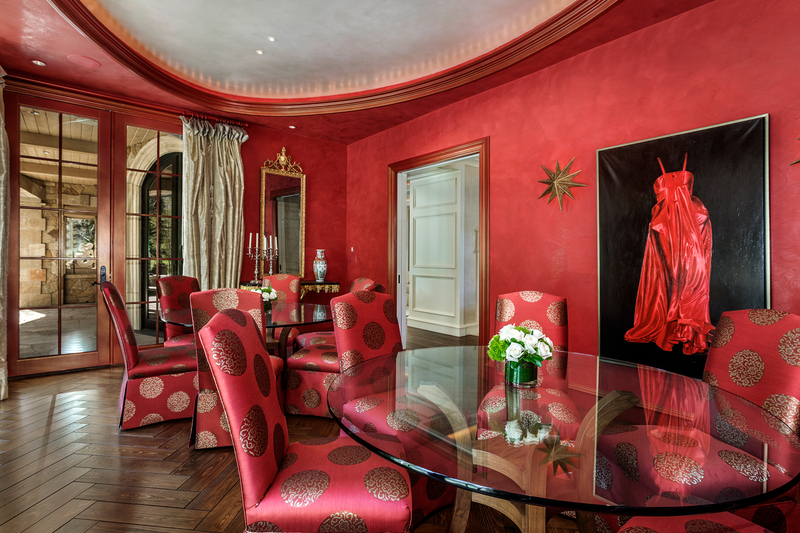 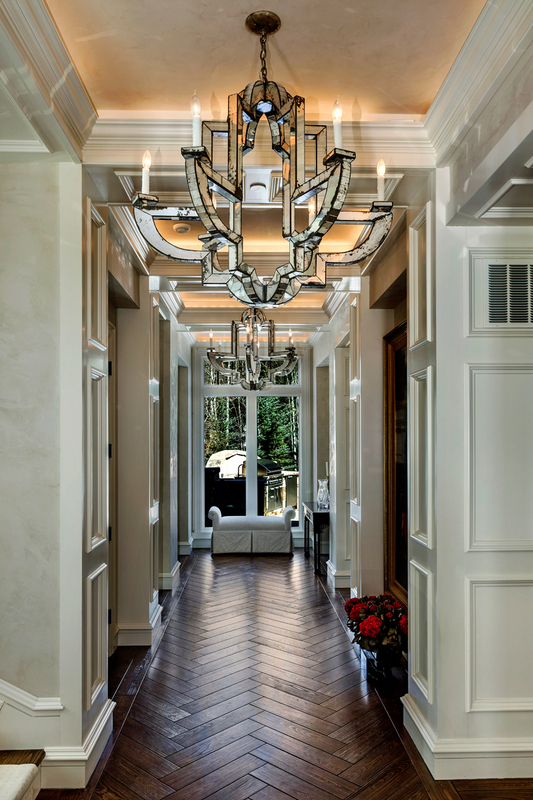 Extravagant details of this home are around every corner. 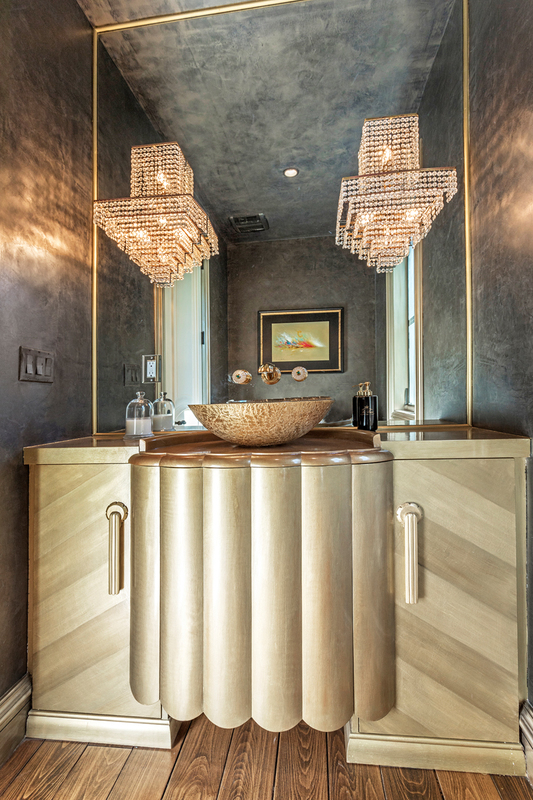 The garage floors are painted an industrial cherry-red polyurethane with liquid crystals embedded in the finish, Lalique faucets and antique chandeliers from Paris in the powder room, Swarovski faucets that look like diamond solitaires in another bathroom, a whole-house humidifying system that supplies the home with properly moisturized air and even custom floor vents were created to be seamless and slim-lined ensuring that a woman’s high heels would not get stuck in the slats. 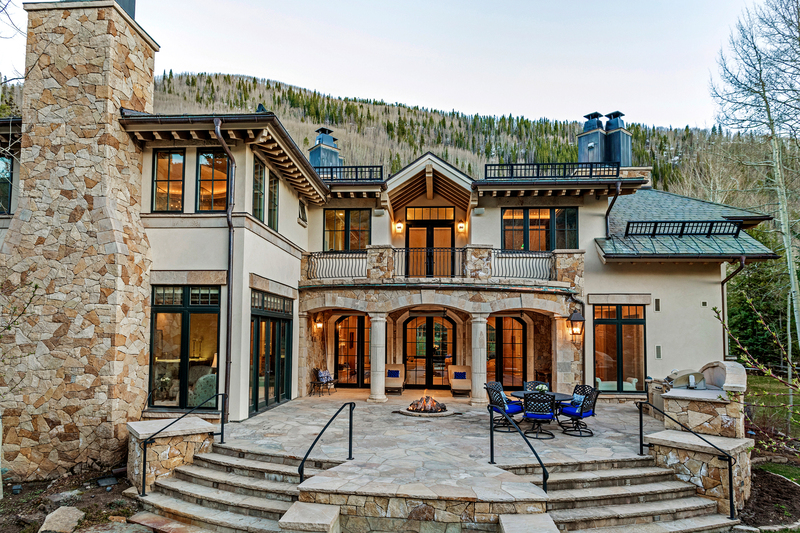 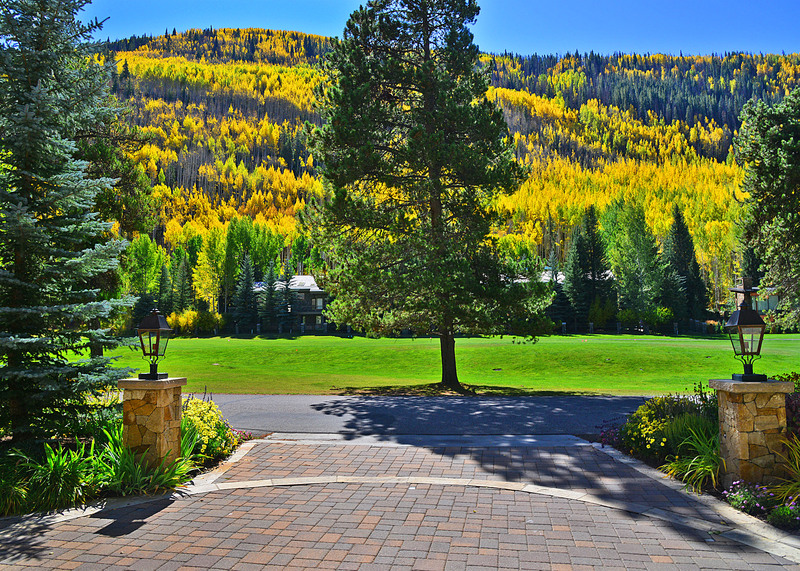 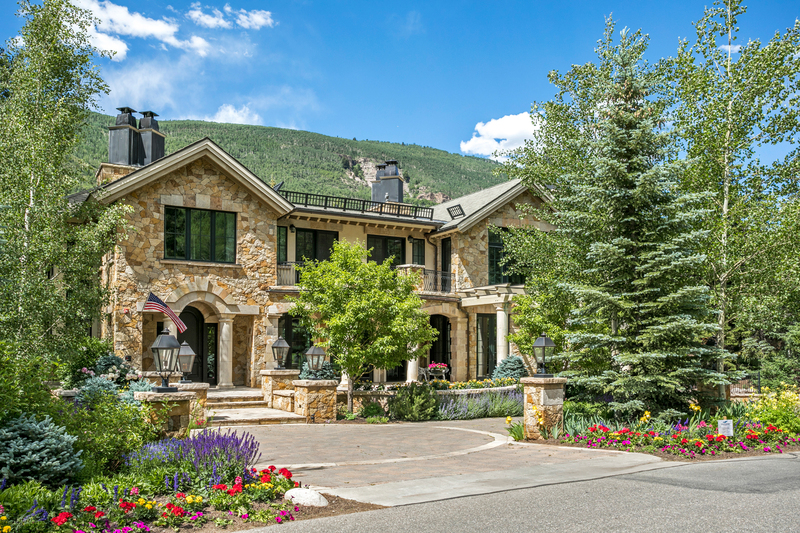 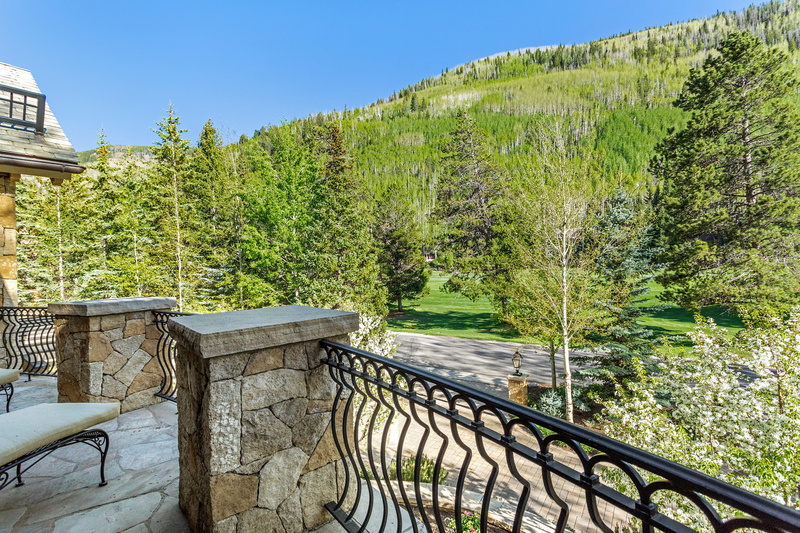 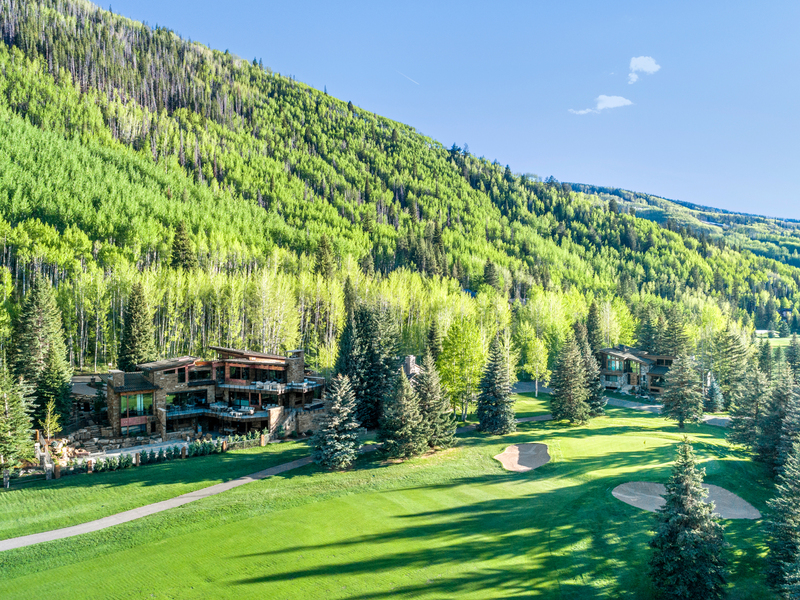 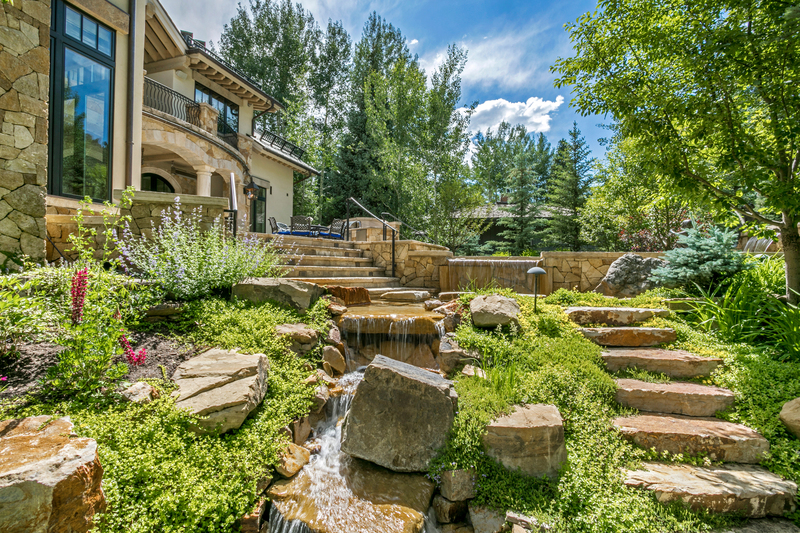 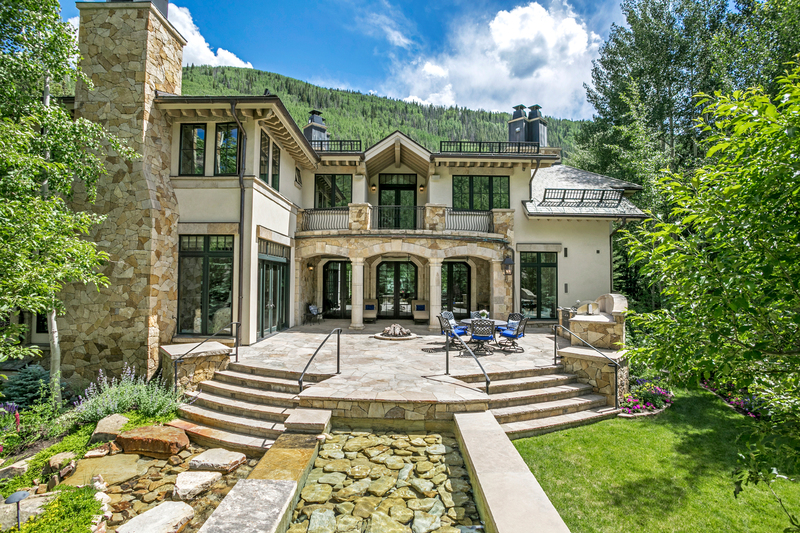 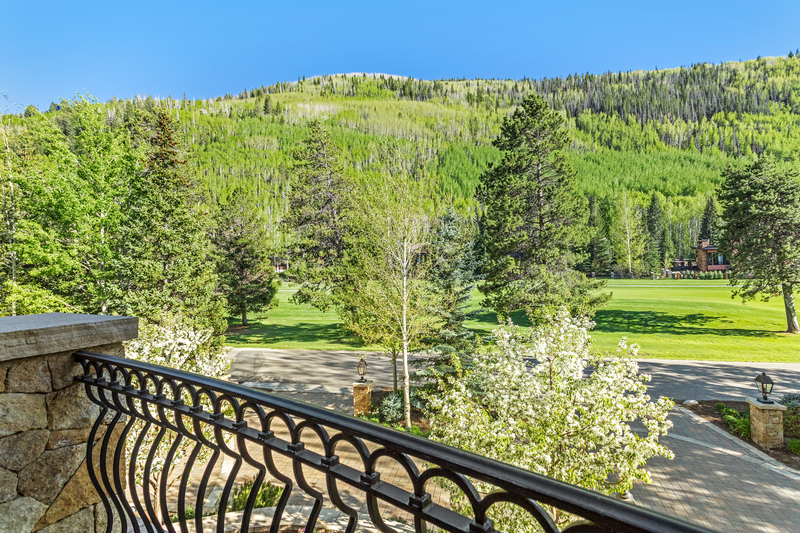 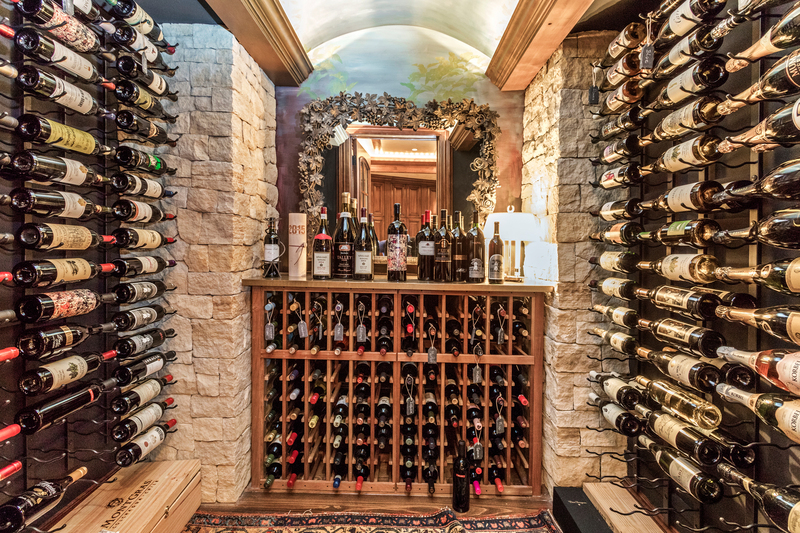 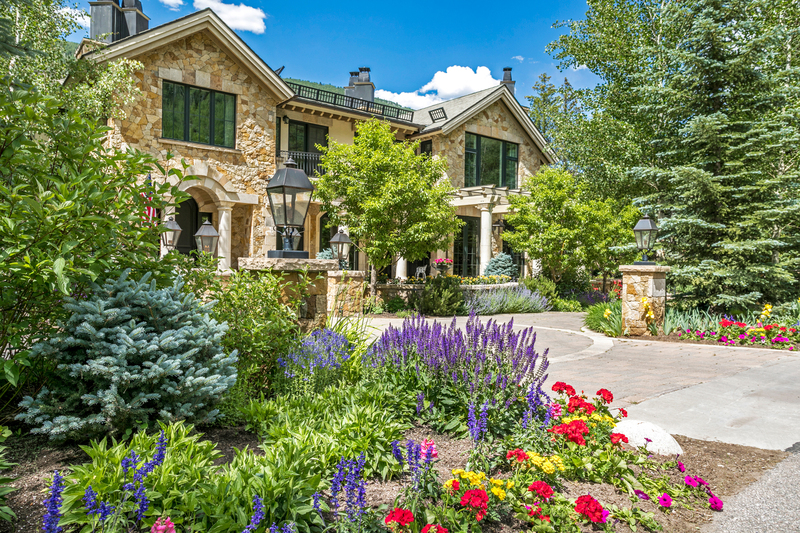 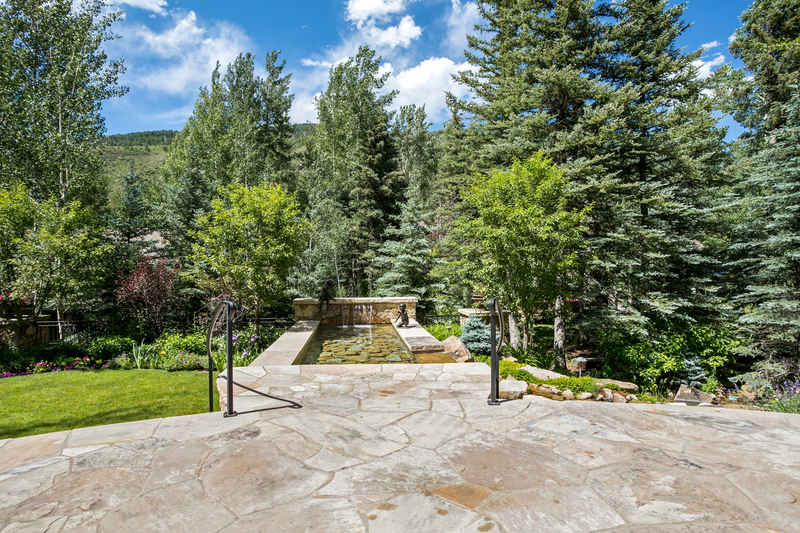 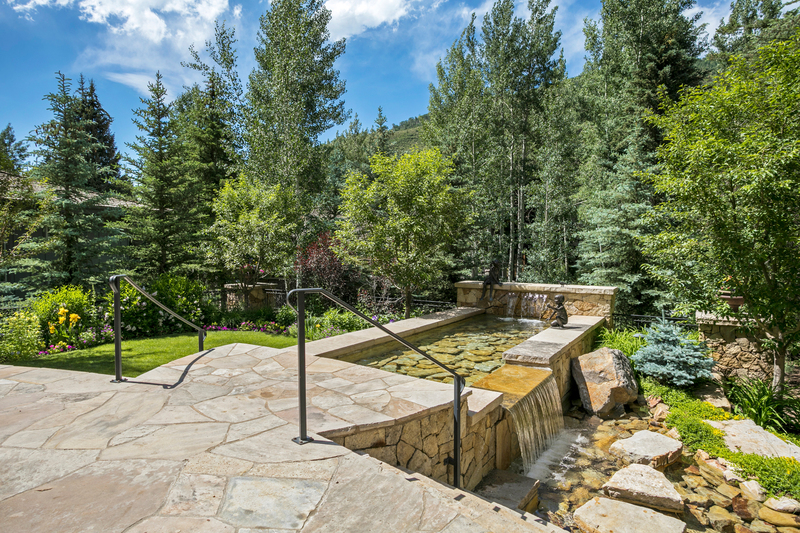 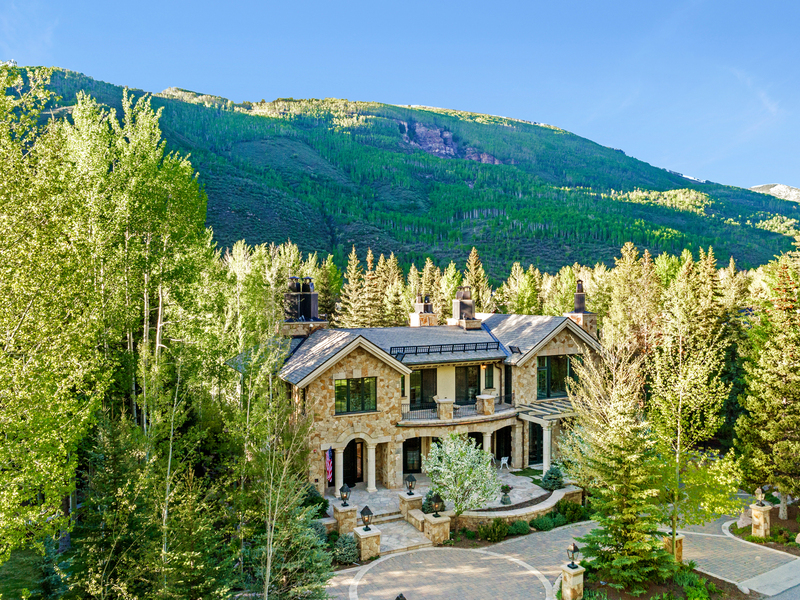 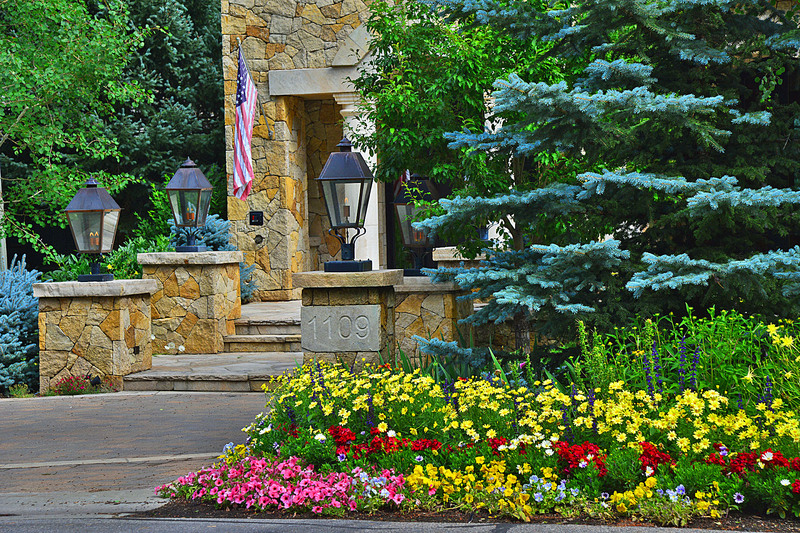 A lifetime of experience was brought together in this exceptional, custom home artfully placed on the Vail Golf Course. 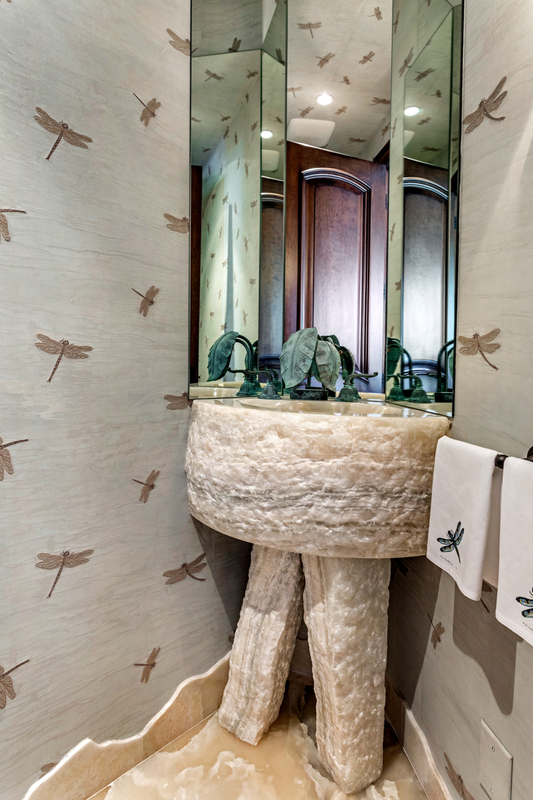 The owner, in concert with her designer, Patricia Herrington, have produced an incomparable, timeless masterpiece. 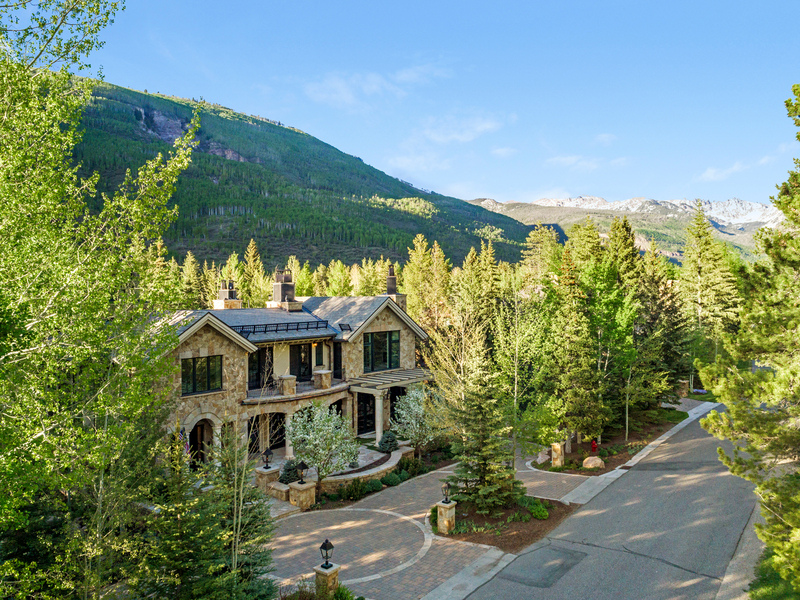 Built to exacting standards with no expense or amenity spared, this 8,416 SF residence effortlessly accommodates daily living and entertaining on a grand scale.